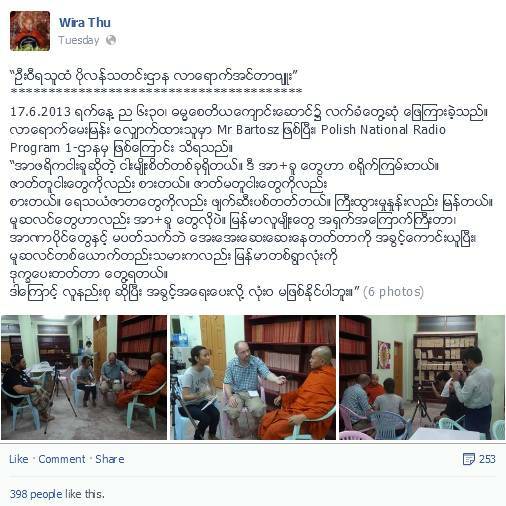 According to the facebook page of U Wirathu, he told Mr. Bartosz from Polish National Radio Program 1 that Muslims must not be granted minority rights. He told to the Polish News Agency on 17.6.2013 6:30pm at Dhamma Saytiya monastery. U Wirathu is the most prominent leader of anti Muslim 969 movement that is conducting business boycott campaign against Myanmar Muslims which is very much resembled to Nazi anti Jewish business boycott. 969 groups are allegedly involved in recent anti Muslim violence across the country. U Wirathu has started preaching anti Muslim hate speeches since 2001 and was arrested for his active involvement in deadly Kyaukse anti Muslim riot in which close to a dozen Muslims were killed. 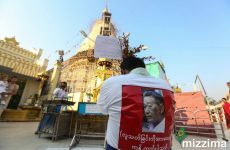 His recent attempt to propose the law that would require any Buddhist woman seeking to marry a Muslim man to gain permission from her parents and local government officials and any Muslim man wanting to marry a Buddhist woman to convert to Buddhism has provoked a lot of protests from democratic forces, human right activists and also moderate Buddhists. “There is one kind of fish species called African catfish. These fish are very wild. They even eat their own kind as well as other kinds of fish. They destroy the water environment too. They also have high growth rate. Muslims are like these African catfish. Burmese people are very shy and humble. They want to stay away from authorities. 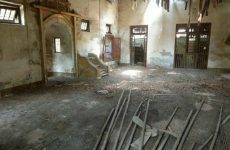 So Muslims take this opportunity and even one Muslim usually gives trouble to the whole Buddhist village. So it is totally impossible to give them minority rights” said U Wirathu according to his facebook page.